Inventory Overload? How to store your inventory off site. Did you recently complete the 2017 Flip Challenge or are you a seasoned FBA merchant? Possibly you own a local retail space. In any case, you’re probably running out of space to store all of your inventory. 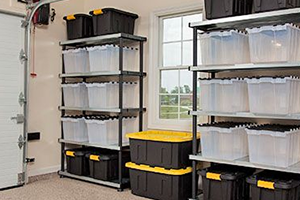 With Bargain Storage, finding space to keep your inventory safe and organized is a cinch. Here are a few storage tips to help you manage that inventory overload. As your inventory grows and grows, it is important to implement a system that helps you keep track of all of your items. Storing items by shelf and bin number is a great way to keep track of where you’ve placed your inventory. This strategy ensures that you do not end up wasting time hunting things down and helps keep your inventory organized since you wont be rummaging through things to find that one item you just sold. Another tip is to keep hot items towards the front of your storage space in order to easily gain access to those items. If you’re looking to be an efficient flipper, you’ll need an efficient shipping setup. Organize boxes and packaging material so that it’s easy to reach. Utilize a cutting mat with a built in ruler and grid to easily measure small boxes and modify boxes alike. In addition, utilize a professional digital scale to confirm weights and to reduce overpaying for shipping. Make sure you estimate your growth accurately. Nothing is worse than moving from one storage unit to another every few months. Planning ahead for your growth and finding a storage unit that is big enough for the long run will be the best business decision you’ve ever made. You can’t predict the future and that’s why it’s important to protect your investment. Check with your insurance provider to confirm your insurance policy covers your inventory stored off site. Find the best storage for your inventory at Bargain Storage today!